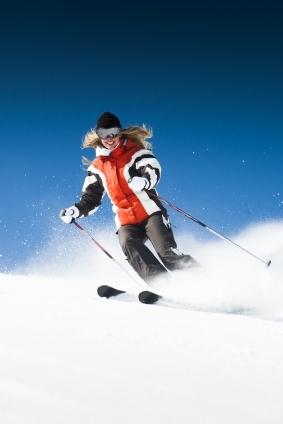 If you’re planning on hitting the slopes this winter, or are into contact sports, be sure you protect your teeth with a custom-fabricated mouth guard. But before you run out to a drug store, be aware that most sold there contain Bisphenol-A, or BPA, a chemical of increasing concern. Why? BPA’s are known to be estrogenic, and can easily travel through cell membranes binding to and stimulating estrogen receptors. While our bodies naturally produce estrogen, an excess of it has been linked to a range of health problems, including some cancers. We should all seek to protect ourselves from further exposure to BPAs, as the material has long been used in the liners of canned food and in water bottles. BPAs are even present in as many as 80% of cash register receipts. Green dentists are particularly conscious about materials choices and many offer lab fabricated mouth guards which are free from BPAs. Dentist-made mouth guards provide the best protection against injury to your teeth, and are also typically more comfortable as they are designed just for you. One BPA-free material used for mouth guards is Eastman’s Tritan copolyester, the same material used in newer versions of Camel Back products and Nalgene water bottles. Also, Invisalign® retainers do not contain Bisphenol-A. Make it a point to talk to your dentist or hygienist about whether a mouth guard is the protection you need this winter sports season. Get one that’s BPA-free and you’ll give your whole body something to smile about.